Preheat grill to medium. Spread half of the tortilla chips in 13- x 9-inch (33 x 23cm) foil pan. Stir together garlic powder, chili powder, paprika and cayenne (if using); sprinkle half over tortilla chips. Scatter half each of the tomatoes, Cheddar, mozzarella and red and green peppers over top. Repeat layers. Cover pan with foil; place on grill and close lid. Cook for about 10 minutes or until cheese starts to melt. Remove foil; cook for about 10 minutes or until golden brown and cheese has melted. Garnish with green onions. 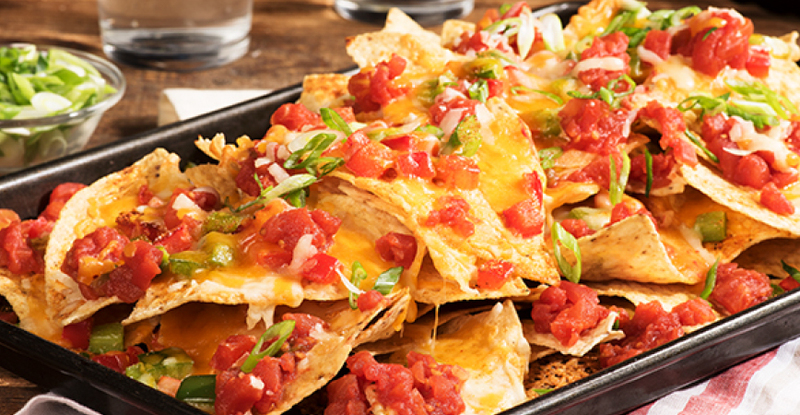 For super-loaded nachos, add shredded cooked chicken, pico de gallo, guacamole, black beans and sour cream. Serve with lime wedges.